The B + W 58mm XS-Pro Digital MRC Nano Kaeseman Circular Polarizing Filter is constructed from select polarizer foils and especially prepared optical glass. Kaeseman ("encased") filters are completely edge-sealed for maximum durability under extreme climatic conditions. XS-Pro filters are extra thin for use with ultra wide angle lenses, yet, they retain their front threads. 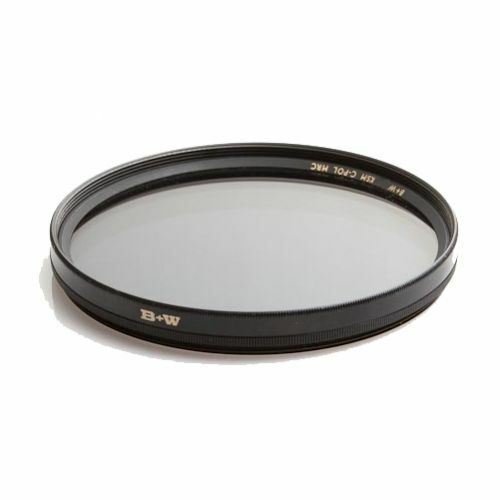 B + Ws MC Nano coating takes filter production to a new level. It features 7-layers of anti-reflection coating as well as improved cleaning capabilities. Water droplets will bead up better and be easier to remove from the filter. This filter is also scratch-resistant. Polarizing filters are used to select which light rays enter your camera lens. They can remove unwanted reflections from non-metallic surfaces such as water or glass and also saturate colors providing better contrast. The effect can be seen through the viewfinder and varied by rotating the filter. The filter factor varies according to how the filter is rotated and its orientation to the sun.